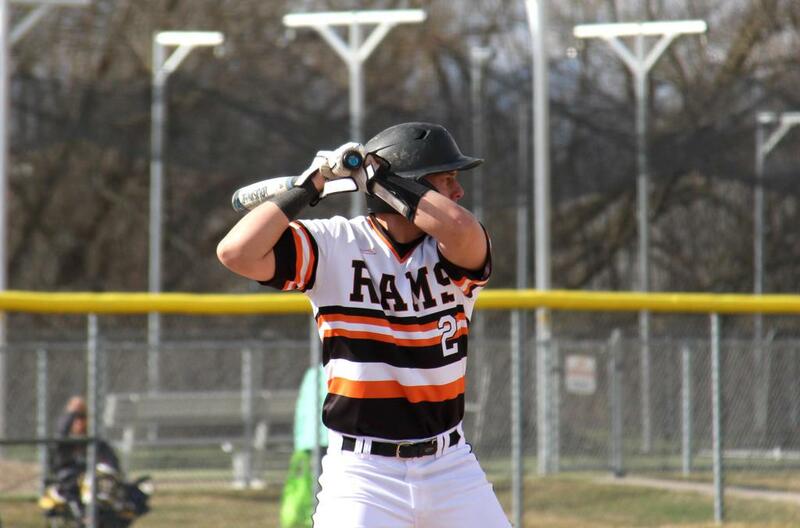 ROCKFORD – The Rams varsity baseball team met Lowell on the diamond for the second time in less than a week, Tuesday, March 26. The Rams earned their second victory of the season with a 12-2 victory in the mercy-shortened game. The Rams also topped the Red Arrows on Saturday. The wins give the Rams a 2-0 start on their 2019 campaign. The victories were particularly sweet since Lowell knocked Rockford out of districts last year by a 1-0 score. Senior Jake Engelkes took the mound for the Rams and started the game with two strikeouts and a ground out to give Rockford plenty of confidence. Rockford scored one in the bottom of the first with Zach Schamp hitting a single to center field and then crossing the plate on a Joe Kelley line drive to left. The bottom of the second saw Rockford score six times on four doubles and two singles. Luke McLean started off the inning with a double, kicking off the hit parade. Joe Kelley, Cody Sterkenburg, Grant Martin all added doubles in the inning, with Owen Cairns and Alex Miller notching singles. The third inning found the score 8-0, Rams, with three baserunners –Kelley, Schamp, and Cairns on when Sterkenburg came up to the plate and hit a grand slam over the left field fence to move the score to 12-0. Ram pitcher Skylar Lennon came on in relief and shut down Lowell in the top of the fourth 1-2-3. In the bottom of the fourth, Joe Degarmo drew a walk, and Jack Richardson knocked a single to center field and then advanced to second on the throw, while Degarmo moved to third. Kellen Mayle drew a walk, but that was as close as the Rams would get to home plate in the inning. McLean took the mound in the top of the fifth, but the Lowell offense was able to only muster two runs and the game ended in a mercy-shortened 12-2 victory for the Rams. Sterkenburg paced the Ram offense going 2-for-3 with a grand slam, a double and five RBI. Schamp was 2-for3 with 2 RBI, Kelley was 2-for-2 with a double and 2 RBI, and Miller went 2-for-2. Cairns was 1-for-2 with an RBI, Martin was 1-for-3 with a double and an RBI, McLean was 1-for-3 with a double, and Richardson notched a single. Miller and Schamp tallied two stolen bases apiece, and Kelley registered one. Englekes pitched three innings giving up no runs on two hits, while striking out five. Lennon threw one inning, giving up no hits and fanned one. McLean pitched one inning, giving up two runs on four hits and one walk, while striking out three. The Rams will travel to take on Bedford North in a double header, Friday, April 5, and then head to Indiana for a Round Robin, Saturday, April 6.